One of the ironies of the Israeli summer is pumpkin. Because when it’s so hot that you want to crawl out of your skin, there’s nothing more appealing than a steaming bowl of pumpkin soup. Or stewed pumpkin. Because this is when pumpkin (and other so-called “winter squashes”) are in season here. Modern agriculture has indeed done away with much of the element of seasonality. And yet, vegetables still have their seasons around here. Members of the squash family are generally planted in the spring, which means they start bearing fruit (or should I say bearing vegetables?) come early summer. So yeah, it’s hot. But if you enjoy eating seasonally like I do, you’ll want to get your pumpkin while it’s in season. In other words, now. And then there’s majadera — a good, whole-protein staple that can turn out quite heavy, depending how you make it. Or in this case, quite light. The majadera recipe I’ve been making for years, which I originally learned from my roommates in Haifa, involves making everything in the same pot. Here, however, the lentils, rice and onions are all prepared in separate pots and then mixed together. Somehow the result is lighter. This is the kind of majadera you’ll get at a restaurant like Tzarum in the Yemenite quarter. Instead of topping the majadera just with fried onions, which is the traditional way of doing things, I added some tiny pumpkin cubes into the mix plus some sugar to help it all caramelize. 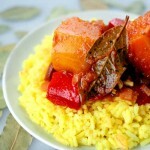 The pumpkin makes this a slightly rounder meal, and adds a colorful seasonal touch. Thus, two foods that often feel quite heavy meet into a slightly lighter, late-summer form. Soak the lentils in advance. This isn’t necessary, but it makes cooking quicker and the lentils easier to digest. Put the lentils in a pot with about 4 cups of water and 1 teaspoon salt. 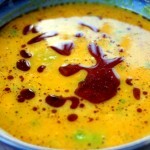 Bring to a simmer and let cook about 30 minutes, or until the lentils are soft enough to eat but not mushy. You want them to hold their shape when mixed with the rice. Drain any leftover cooking water. Put the rice in a pot with 3 cups of water and 1 teaspoon salt. Bring to a low simmer and let cook about 10 minutes, until the water is absorbed and the rice is soft. Gently toss the rice with the lentils and the olive oil. The olive oil will provide lots of flavor. To prepare the topping: Cut the onions into thin slivers and put in a deep pan with 1/2 cup vegetable oil. (Yeah, it’s a lot of oil, but it helps the vegetables cook. I use vegetable oil instead of olive oil here because the long cooking time would kill any flavor in the oil.) Let simmer on a low flame. In the meanwhile, cut the pumpkin into 1-centimeter (1/2-inch) cubes and add to the onions. Stir occasionally, giving the vegetables a chance to brown slightly. You want to see them softening, too. Add the 1/4 cup brown sugar, mix, and let simmer until all the vegetables are soft and lightly caramelized. This could take 30 to 45 minutes. 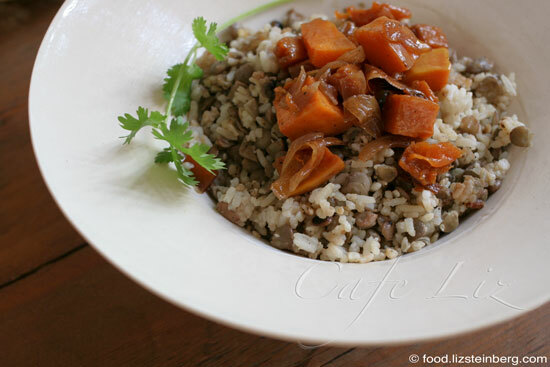 Serve the rice and lentils topped with the pumpkin and onion. 11 Responses to "Majadera with caramelized pumpkin"
I love pumpkins and have been using them quite a lot since I returned from Finland.Your majadera with pumpkin looks lovely! All the pumpkins and squash in summer drive me nuts here! But I, too am adapting and have a small pumpkin sitting in my kitchen, ready to cook – this sounds amazing. Love the caramelized pumpkin on top of mujadara! Great idea. Hey, yeah, that’s the answer. Sorry, took me a while to respond. We have “winter” squash now too. I just cooked one called kabocha (my favorite) and I have a butternut squash waiting. 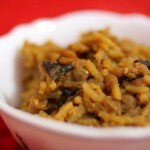 Love your idea of caramelizing them with onions to top majadra is great. I think I might roast the onions with the squash cubes in the oven (I know, it’s really hot here too) but then they’ll brown with less oil and in about the same time. Hey Faye, that’s a good idea. I bet that would be a nice touch. I could not resist and made this last night. Good thing I bought a really big pumpkin and can make this again some time soon because my family likes it a lot. Wonderful recipe.